We got our apple cider into our fermentation chamber where it’s bubbling away to create a delicious cider in a few months. The redder one is Dave and Heidi’s who inserted a bunch of cranberries into theirs. Ours is straight apple juice. 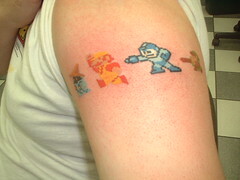 This guy got a tattoo of MegaMan on his arm – my jaw dropped – how cool!! When Heidi saw it she laughed and said, “that guy’s going to regret that one!”. I don’t think so! 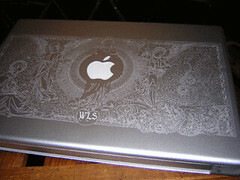 Laslty, I found a picture of a person who did some INCREDIBLE engraving on the cover of his Mac laptop. I think if you look closely it’s Jesus and some other things – so cool!